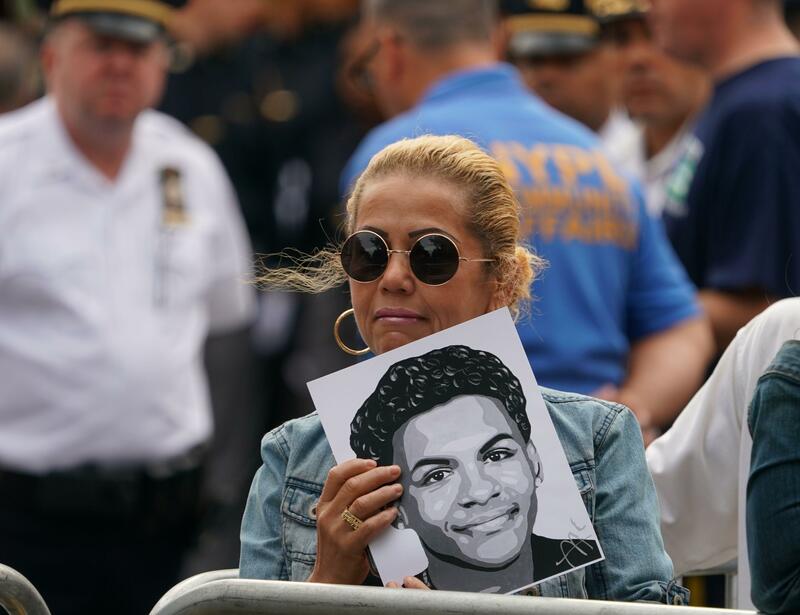 NEW YORK -- Thousands of mourners said farewell Wednesday to 15-year-old Lesandro Guzman-Feliz. He was brutally stabbed to death last week, shocking the community in the Bronx. Six suspects were extradited from New Jersey and appeared in court earlier to face murder charges. Funeral services were held at Our Lady of Mount Carmel Church in the Bronx for Guzman-Feliz, affectionately known as Junior, who was attacked by a gang of men outside a bodega June 20. He collapsed and died while running to a nearby hospital after being stabbed and slashed in the neck with a machete. The funeral ended with a crowd of several hundred outside the church chanting of "Justice for Junior!" The boy's father was among loved ones wearing Yankees jerseys, a team his son passionately cheered for, CBS News York reports. Guzman-Feliz was remembered as a cheerful kid who loved pepperoni pizza, video games and had a passion to one day become a police officer. "Here's a mother going through the most difficult thing anybody could go through," Father Jonathan Morris told CBS New York. "She wants justice for Junior but also saying no to retaliation, saying no to vengeance." Eight suspects have been arrested on murder, manslaughter and gang assault charges, including six who were extradited from New Jersey on Wednesday. Authorities said the suspects are members of the Trinitarios gang: Kevin Alvarez, 19, Elvin Garcia, 23, Jose Muniz, 21, Jose Tavarez, 21, Jonaiki Martinez-Estrella, 24, Daniel Fernandez, 21, Manuel Rivera, 18, and Antonio Hernandez-Santiago, 24. Members of the teen's family went back to the memorial at the bodega following Wednesday's funeral to light more candles for "Junior." They asked for privacy as the 15-year-old's loved ones continue to grieve. They said Guzman-Feliz, who dreamed of becoming a police officer and was a member of the NYPD's Explorers program, may have been mistakenly targeted by the gang. "He wanted to save people," John Grace, an auxiliary police officer with the 45th precinct, told CBS New York. "That was his desire to become a cop." The boy's killing was captured on video surveillance and was widely condemned. A makeshift memorial outside the bodega, which was visited by NBA star Carmelo Anthony, continues to grow. Mayor Bill de Blasio said he wants find a way to honor his memory by naming part of the Explorers program after him. "We want the next generation of young people who want to serve in the police to know about the young man who didn't' get a chance to, and be inspired by him," de Blasio said during "Inside City Hall," a live broadcast on NY1.